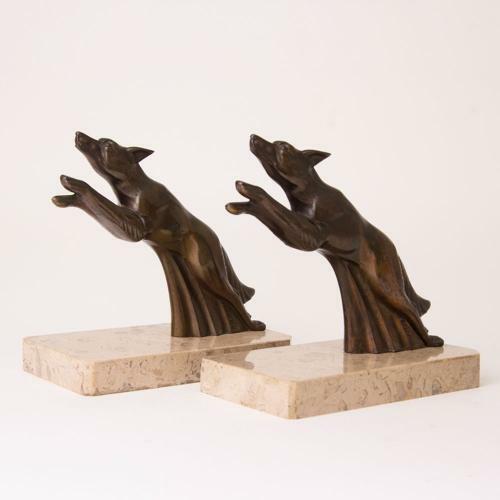 Beautiful set of bookends with jumping dogs that are made of zamac with a bronze coating on marble. signed 'Franjou', a pseudonym for Hippolyte Moreau. Hippolyte Francois Moreau was a French sculptor famous for his bronze statuettes of young women. Born in 1832 in Dijon, France as the son of the renowned sculptor Jean-Baptiste Moreau, he grew up learning from his father’s workshop. As a young man, Moreau moved to Paris to study further under Francois Jouffroy at the École Nationale Supérieure des Beaux-Arts, first exhibiting at the Salon of French artists in 1863 and continuing to show work there until 1914. In both 1878 and 1900, he won medals for his work—large-scale, decorative pieces such as vases and statuettes—at the Universal Exposition in Paris. Among his notable sculptures is his 1880 statue of the celebrated French mathematician Alexis Clairaut, which now permanently occupies one of the facades of the City Hall of Paris. He died in 1927 in Neuilly-sur-Seine, France, and today many of his works are collected in the Museum of Fine Arts in Dijon.